When the great emperor of China demands that Chan Lo carve him a dragon of wind and fire, Chan Lo is overwhelmed. No matter how hard he listens to the perfect jade stone, he does not hear dragons. This Chinese folktale is warmly illustrated, evoking the majesty of ancient China and the gentle message of artistic truth. *"A wonderful read aloud, with great sound effects . . . a tale of artistic integrity told with artful simplicity . . . accessible to young children." Chan Lo is a humble stone carver who is given a perfect piece of green and white jade to carve by the Great Emperor of All China. Is there a dragon in the stone, as the Emperor demands? What does Chan Lo hear the stone say? What does it want to be? When Chan Lo finally succumbs to the stone's true wishes, the emperor is furious and throws him in prison. 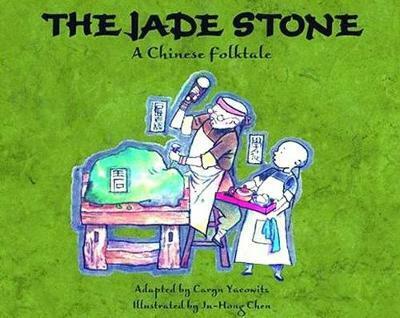 Can the spirit of the jade stone save the stone carver's life? Warmly illustrated by painter Ju-Hong Chen, this Chinese folktale offers a clear and gentle message of artistic truth and a lesson in staying true to one's self. Author Caryn Yacowitz lives in Palo Alto, California. She has published eleven children's books, including a series of books on Native Americans, and her poetry and plays have appeared in several anthologies. She holds a master of arts degree in creative writing from San Francisco State University and an undergraduate degree in history/political science from Rutgers University. Ms. Yacowitz teaches writing at several colleges and universities in northern California. Her picture book Pumpkin Fiesta was named to the California Collections in 2005. Illustrator, designer, and painter Ju-Hong Chen was born in Shanghai, China. Since moving to America in 1982, he has illustrated a number of children's books. He lives in Beaverton, Oregon, with his wife and daughter. Author Caryn Yacowitz lives in Palo Alto, California. She has published eleven children's books, including her Native American Series, and her poetry and plays have appeared in several anthologies. She holds a master of arts degree in creative writing from San Francisco State University and an undergraduate degree in history/political science from Rutgers University. Ms. Yacowitz teaches writing at several colleges and universities in northern California. Her picture book Pumpkin Fiesta was named to the California Collections in 2005. Ju Hong Chen is a self-taught artist who grew up in Communist China. Purposely avoiding the "official line" training of China's art schools, he worked as an art designer in a factory. He moved to the United States in the 1980s, and his first picture book, The Magic Leaf, was named a Parents' Choice Honor Book for illustration soon after his arrival. His first book with Pelican, The Jade Stone, received a starred review from Kirkus and was named a best picture book by the San Francisco Chronicle and Book Links. Some of the book's art was included in the textbooks Stories on Stage: Scripts for Reader's Theater and Junior Great Books Series 2. Chen resides in Beaverton, Oregon.